Hey, boo. Hey. Put that cookie down, girl. We need to talk. 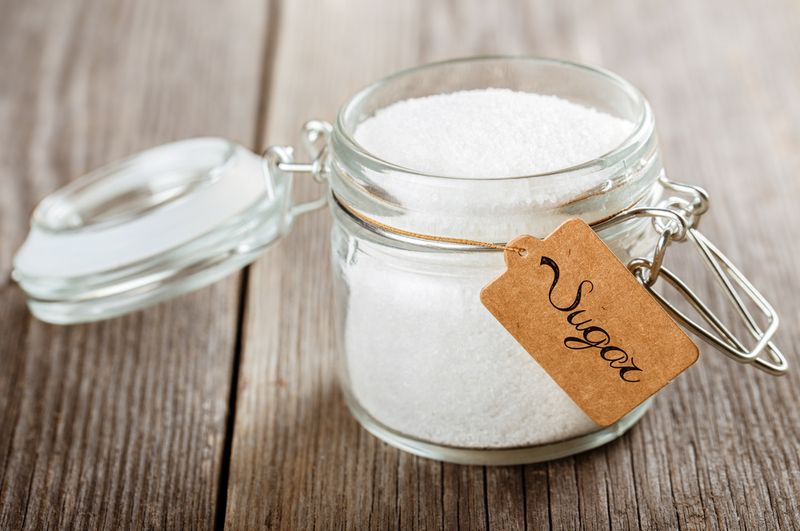 Take it from someone who is successfully decreasing the amount of sugar in her life: letting go of the sugar is no easy feat, but it is the most important part of a healthy living journey. I’m not even going to spend ten paragraphs telling you why you need to let it go… just know… I make a pretty convincing argument. 1) You absolutely need sugar, but not in the form in which you’re getting it. 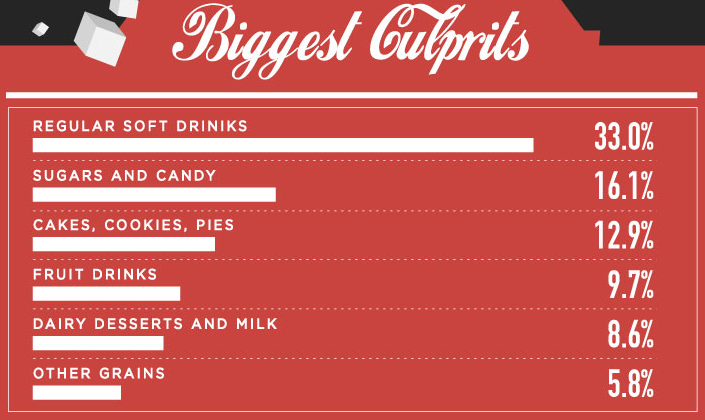 There are trace amounts of sugar in everything, but where are you most likely getting it from? Make no mistake about it – you need sugar. It’s found in our produce for a reason. This high sugar, low-fiber foolishness going on in processed foods right now? Ch…. not gon’ cut it. 2) Sugar could, quite possibly, be one of the real contributors to heart disease. In the August 2013 cover story for National Geographic…. […] fat makes up a smaller portion of the American diet than it did 20 years ago. Yet the portion of America that is obese has only grown larger. The primary reason, says Johnson, along with other experts, is sugar, and in particular fructose. Sucrose, or table sugar, is composed of equal amounts of glucose and fructose, the latter being the kind of sugar you find naturally in fruit. It’s also what gives table sugar its yummy sweetness. (High-fructose corn syrup, or HFCS, is also a mix of fructose and glucose—about 55 percent and 45 percent in soft drinks. The impact on health of sucrose and HFCS appears to be similar.) Johnson explained to me that although glucose is metabolized by cells all through your body, fructose is processed primarily in the liver. If you eat too much in quickly digested forms like soft drinks and candy, your liver breaks down the fructose and produces fats called triglycerides. is a cause of heart disease. High cholesterol. High blood pressure. Heart attacks. Strokes. 3) Sugar is the reason why you believe you have no will power. Time and time again, people express guilt about feeling like they “lost control,” “couldn’t put it down,” “ate the whole bag,” or some other similar story. Trust me, it’s not your fault. Sugar causes addictions. In one 2010 study, scientists at Scripps Research Institute in Jupiter, Florida, fed rats an array of fatty and sugary products including Hormel Foods Corp. bacon, Sara Lee Corp. pound cake, The Cheesecake Factory Inc. cheesecake and Pillsbury Co. Creamy Supreme cake frosting. The study measured activity in regions of the brain involved in registering reward and pleasure through electrodes implanted in the rats. “To see food do the same thing was mind-boggling,” Kenny later said in an interview. …but wait – there’s more! In one 2010 study conducted by researchers at the University of Texas in Austin and the Oregon Research Institute, a nonprofit group that studies human behavior, 26 overweight young women were given magnetic resonance imaging scans as they got sips of a milkshake made with Haagen-Dazs ice cream and Hershey Co.’s chocolate syrup. The same women got repeat MRI scans six months later. Those who had gained weight showed reduced activity in the striatum, a region of the brain that registers reward, when they sipped milkshakes the second time, according to the study results, published last year in the Journal of Neuroscience. “A career of overeating causes blunted reward receipt, and this is exactly what you see with chronic drug abuse,” said Eric Stice, a researcher at the Oregon Research Institute. […] psychologists at Princeton University began studying whether lab rats could become addicted to a 10 percent solution of sugar water, about the same percentage of sugar contained in most soft drinks.An occasional drink caused no problems for the lab animals. Yet the researchers found dramatic effects when the rats were allowed to drink sugar-water every day. Over time they drank “more and more and more” while eating less of their usual diet, said Nicole Avena, who began the work as a graduate student at Princeton and is now a neuroscientist at the University of Florida.The animals also showed withdrawal symptoms, including anxiety, shakes and tremors, when the effect of the sugar was blocked with a drug. The scientists, moreover, were able to determine changes in the levels of dopamine in the brain, similar to those seen in animals on addictive drugs.“We consistently found that the changes we were observing in the rats binging on sugar were like what we would see if the animals were addicted to drugs,” said Avena, who for years worked closely with the late Princeton psychologist, Bartley Hoebel, who died this year. While the animals didn’t become obese on sugar water alone, they became overweight when Avena and her colleagues offered them water sweetened with high-fructose corn syrup. Your struggle with “saying no” isn’t about you being a failure – it’s about “using the body’s natural reaction to sugar against you” being a business plan for corporations. If you eat it all, keep buying it, and eat all of that in a vicious cycle, it keeps them in business. Which makes sense, when you think about how PepsiCo is a billion dollar multi-national corporation. 4) Sugar destroys your ability to detect “sweet” in fresh fruits and vegetables. When I tell people that I find softened onions cloyingly sweet and have to only have them in moderation, they’re confused. It’s an onion! they tell me. It’s sweet. But when you’re used to 6-10 grams per serving in everything you eat, almost 30 grams (7 teaspoons!!!!!) in just about everything you drink, the little bit of sugar in a cup of spinach – where there’s more fiber than there is sugar – is non-existant, and it tastes horribly bitter to you. It wrecks your ability to enjoy fresh flavors, because you’re used to processed food versions. Flavors like “grape,” “watermelon,” and “strawberry” – relatively not-sweet fruits – in candies taste nothing like their fresh fruit counterparts. Want to take a guess as to why? The Trust employed a panel of ‘taste experts’, including sommelier Oz Clarke, to identify the ‘endangered tastes’ of England and Wales. The panel found different flavours as distinct as regional accents. For example the lush dishes of Cornish ice cream and new potatoes result in a “cream and honey” flavour for the region. In comparison bakewell tart and pale ale makes the taste of the Midlands “gamy and proud”. However the Trust fear that these regional tastes are in danger of going extinct as fewer people are able to appreciate the subtleties of flavours in fresh, seasonal products. Therefore farmers will be unable to continue growing forced rhubarb in Yorkshire or cherries in Kent because there is so little demand and regional flavours will die out. 5) Sugar never leaves you feeling satisfied – it only leaves you feeling hungrier… often, for more sugar. Regardless of whether or not you already full or even sick – if you’ve had enough sugar to trigger that feeling in your brain, it will compel you to continue eating. Listen, Linda, honey. This is hard for all of us. Sugar has become a ubiquitous part of our lives. Everyone we’ve entrusted with the task of providing us with food has managed to slip it into our everyday diets. Breakfast here, lunch there, a drink over there, and before we know it, we’ve consumed 125 grams of it totaling an additional 500 calories in our diet, amounting to an extra pound of fat gained each week that we must burn off in order to maintain our current weight, and adding one more hurdle when it comes to achieving our fitness goals. If not, here’s a handy infographic to get the point across! Erika, I’m a law student and I live on coffee. Seriously. Not even kidding. I’d love to give it up, but I need it…at least until I finish first year. That being said, what would you suggest I use in my coffee in place of sugar? Stevia? Splenda (though I must admit I’m afraid of the artificial stuff)? I don’t use a lot of sweetener, and I don’t use a lot of cream. I can actually take it black, I just need some sweetener. Any recommendations? You SHOULD be afraid of the synthetic stuff! Try coconut sugar, maple syrup, or just try upping the quality of your coffee. Sometimes bad coffee, burned coffee, overheated, old, or poorly-stored coffee has a bitter, acidic taste to it. A good coffee is going to have a smooth, even rich dark chocolatey taste to it. I’d also say, if you ate a little bit more or incorporated more fresh fruit into your diet on a more reliable schedule, you might be able to forego the coffee altogether. Just found this site. It is AWESOME! I am also a coffee junkie. I also used to always need cream and sugar in my coffee. Until – as Erika noted – I discovered GOOD coffee. A nice indie place opened near us. The quality of the coffee is so great that I drink it straight black with nothing added. Depending on the brew of the day, I detect chocolatey, fruity or even caramel notes. Honestly I’ve found it even satisfies my sweet tooth. I also read somewhere (Mercola site I think?) that straight black coffee may help banish sugar cravings.